Today’s card of the day is Regalia’s Perfect Guard shown in the anime. 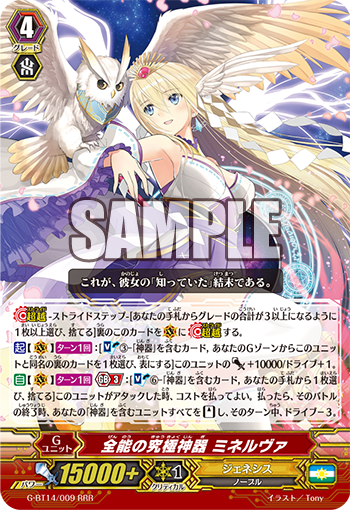 AUTO [Choose a card from your hand, and discard it] When this card is placed on (GC) from your hand, you may pay the cost. If you do, choose one of your units with “Regalia” in its card name and that unit cannot be hit until the end of that battle. 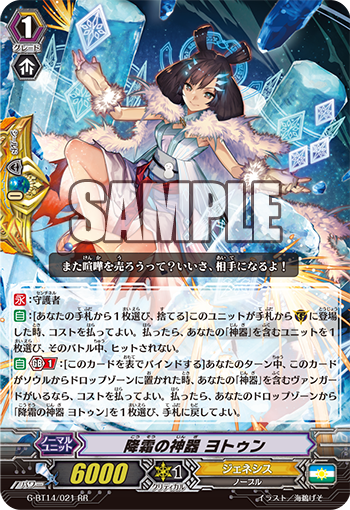 AUTO Generation Break 1 [Bind this card face-up] During your turn, when this card is put into your drop zone from your soul, if you have a vanguard with “Regalia” in its card name, you may pay the cost. If you do, choose a “Regalia of Frost, Yotun” from your drop zone, and you may return that card to your hand.